Wide-area measurement system (WAMS) is an important part of present power system structure as it provides real-time synchronized measurements of the system with the aid of phasor measurement units (PMUs). Due to economic considerations, PMUs should be installed at optimal locations. The optimal placement of PMUs (OPP) is a problem of optimally placing PMUs at strategic locations maintaining the full observability of the system. In this chapter, a novel binary whale optimization algorithm (BWOA) is applied to solve OPP problem. The maximization of measurement redundancy is considered in the objective function. The proposed algorithm is examined on five different test systems operating under normal operating conditions with or without inclusion of zero-injection buses (ZIBs) and compared with the reports available in literature. The results show the effectiveness of the proposed algorithm in solving OPPP. There is tremendous advancement in communication technology in past decades. With these advancements, their applicability to various fields of sciences and engineering is increasing day-by-day. The power system is also under the influence of the advanced communication technologies. Presently, the power system is undergoing vast changes in terms of its expansion, interconnections of various areas and inclusion of advanced communication technologies. 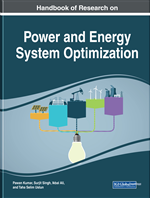 The primary reason behind this changing power system is fast growing power needs. Owing to these increasing power demands, the system experiences stressed conditions and the security and reliability of power supply is endangered (Kundur, Balu, & Lauby, 1994). Thus, the secure and reliable operation of the power system is turned into a major concern of electric utility. The security and reliability of power supply can be enhanced if it is possible to monitor the whole power system on real-time platform. Real-time monitoring of the system in present scenario is very much possible with the aid of advanced communication infrastructure. Wide-area measurement system (WAMS) is one such system of advanced communication infrastructure which is used in monitoring of the power system. Phasor measurement units (PMUs) are vital part of WAMS. PMUs are the advanced measuring devices which take synchronized measurements of the system with the help of global positioning system (GPS) (Phadke & Thorp, 2008). They are installed at respective buses of the system to measure voltage phasors of the buses and the current phasors of the branches connected to those buses. It is a well-known fact that when a PMU is installed at one of the buses of the system under consideration then, it will measure the synchronized voltage phasor of the bus with the synchronized measurement of current phasors of all the lines connected to the bus. As a result, the bus can be termed as directly observable in case stated above. However, the voltage phasor of the bus, connected with the line whose current phasor is known from other PMU measurement, can be computed easily. In this case, the bus is termed as indirectly observable. From the above discussion it can be concluded that a bus is observable if a PMU is installed on it or it is connected to a line whose current phasor and the voltage phasor of the bus present to the other side of the line are known from PMU measurements. This implies that the number of PMUs to be installed in a power system to make it fully observable can be reduced by choosing strategic locations for their placement. Thus, this problem of reducing the number of PMUs in a system provides a platform for a binary optimization problem and termed as optimal placement of PMU problem (OPPP). The main objective of OPPP is to reduce the number of PMUs in a system by placing them at strategic locations such that the system is fully observable. Several attempts are reported in literature to solve OPPP. The solution methods adopted to solve OPPP can be categorized in two categories: conventional methods and meta-heuristic algorithm based methods. Conventional methods include linear programming, quadratic programming, mixed programming etc. However, the disadvantages associated with these methods like local minima trapping and slow convergence rate made a way for use of more efficient algorithms in solving OPPP. The evolution of meta-heuristic algorithms eradicated the disadvantages associated with conventional methods and prompted their application in solving OPPP. Some of the relevant reports are discussed in next section. However, there is always a scope of finding newer methods to solve the problem. In this work, a novel binary whale optimization algorithm (BWOA) is proposed and applied to solve OPPP. Whale optimization algorithm (WOA) is a recent population based optimization algorithm available in the literature and the application of the binary version of the algorithm is investigated in solving OPPP. The prime objectives of this work are outlined as below. Examining the effectiveness of BWOA by applying it on different standard test systems under different scenarios. Testing the superiority of BWOA by comparing it with results reported in literature. Binary Optimization Problem: An optimization problem in which the output is in binary form. Zero-Injection Bus: A bus with no generation and no load. Phasor Measurement Units: A modern measuring device which takes the synchronized measurements of voltage and current phasors. Optimal PMU Placement Problem: A problem of optimally placing PMUs in a network maintaining the full observability of the network. Measurement Redundancy: Total count of observability of a bus by different PMUs either directly or indirectly. Bus Observability: A bus is said to be observable if its voltage and branch currents are measurable. Binary Connectivity Matrix: A matrix containing the information of the connectivity of the buses in a network. Observability Constraint Vector: A constraint vector having information about the observability of a network.